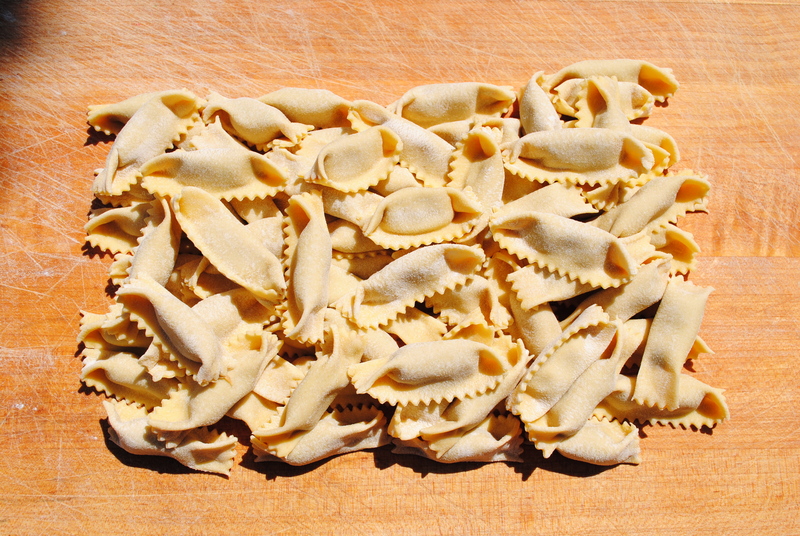 Wild Boar Plin is a pinched ravioli filled with (you guessed it) Wild Boar. We adapted this filling from when I was in Tuscany and had the Cinghiale Sauce atop the wide cut pasta called Pappardelle. This sauce is a beautiful robust stewy sauce with red wine, tomato and herbs. I thought that this would be a perfect combination wrapped up in the arms of pasta. We marinate the wild boar meat overnight in the red wine with the variety of herbs. The next day, we cook it with the tomatoes for many hours until it is a reduced down version of the sauce I fell in love with in Tuscany. I recommend enjoying this pasta with a simple butter & sage sauce. Melt 1/3 of a stick of butter with 5 fresh leaves of sage. I personally do not brown the butter. If you have a bit of marinara from the night before, add a couple of spoons to the butter and sage. Brings it up a notch. Sorry for the late reply. You can find us at te Ballard Farmers Market every Sunday 10-3pm.